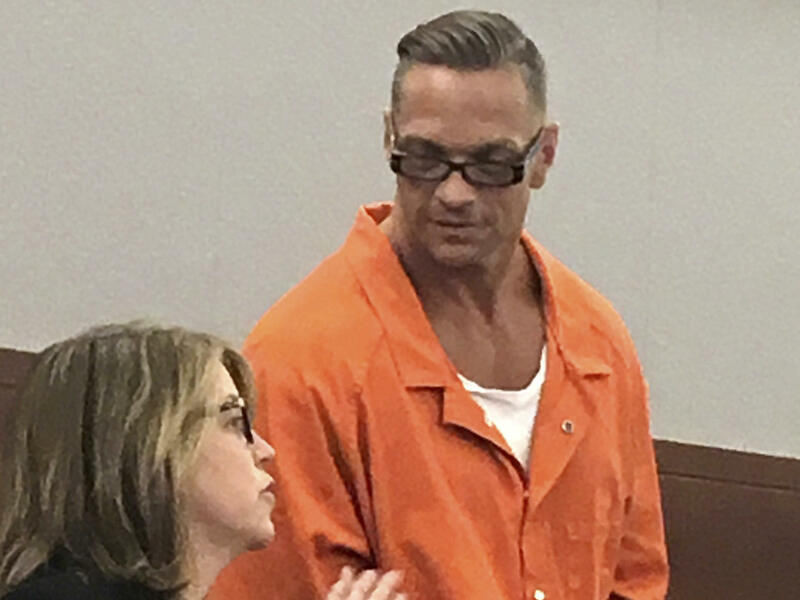 Nevada death row inmate Scott Dozier, shown here during a 2017 court appearance, was scheduled to be executed on Wednesday night but the execution was postponed indefinitely. Convicted murderer Scott Dozier has clearly and repeatedly stated that he wants to be executed. The planned execution, using a three-drug cocktail, had been set for Wednesday evening at Ely State Prison in Nevada. Experts say it would be the first time the opioid fentanyl was used in a U.S. execution. However, a pharmaceutical company filed a lawsuit Tuesday against the Nevada State Department of Corrections over plans to use one of its drugs, midazolam, in the execution. And on Wednesday, Clark County District Judge Elizabeth Gonzalez "disallowed the use of the drug," effectively putting the execution on hold, The Associated Press reported. Department of Corrections Public Information Officer Brooke Santina said in an emailed statement that Dozier's execution "will not take place until further notice." Alvogen, the pharmaceutical company, said in a statement that it "does not condone the use of any of its drug products, including midazolam, for use in state sponsored executions." It also said it "does not accept direct orders from prison systems or departments of correction." That's why it is accusing Nevada of illegitimately acquiring the midazolam it planned to use to execute Dozier. Santina said she could not comment on that accusation. This is the second lawsuit of its kind in the U.S. from a pharmaceutical company, according to the Death Penalty Information Center, which tracks data about the death penalty and has criticized the way capital punishment is administered in America. Many states are having difficulty obtaining the drugs for lethal injection cocktails, as manufacturers increasingly object to having their drugs used in this way. And Nevada is no exception. "The state issued 247 requests for proposals on Sept. 2 after its stockpile of at least one drug used in executions had expired. Not one response was received," according to a 2016 report in the Las Vegas Review-Journal. "What we're seeing from the drug companies is rather than simply protesting that the drugs have been improperly obtained, they're going into court to try to protect their corporate interests and to try to protect the integrity of their medicines," Death Penalty Information Center Executive Director Robert Dunham said in an interview. He added: "If you're saying that the death penalty is necessary as a tool of law enforcement, what kind of message are you sending if you are breaking the law or deliberately deceiving companies and breaching contracts in order to carry out the law?" The ACLU has also filed a lawsuit this month seeking records related to the state's execution protocol. Dozier's execution would have been the first in Nevada since 2006, according to the AP. It's been postponed before. He had been scheduled to be executed in November 2017, then a stay of execution was issued over concerns about another drug in the protocol. "I don't want to die," he told The Marshall Project days after the execution was stayed in 2017. "I just would rather be dead than do this." Dozier was sentenced to death over the first-degree murder in 2002 of Jeremiah Miller, whose dismembered body was found in a trash bin in Las Vegas. Now, Dozier is what is known as a "volunteer," or a death row inmate who has abandoned further appeals. As he told the Marshall Project: "I think it's just time for me to pay the price." The fact that he is not putting up a legal contest to the never-before-used method of his execution, a protocol made up of midazolam, fentanyl and cisatracurium, means that "there is nobody in the court system who is vindicating the public interest" about whether it is legal and constitutional, said Dunham. The synthetic opioid fentanyl is a drug at the center of the U.S. opioid crisis. "It's somewhat ironic that at the same time that the Justice Department and states are talking about how dangerous fentanyl is, and how it's created a national public health emergency, that states are now turning to it as a supposedly safe way of killing prisoners," Dunham added. In an interview that aired Tuesday on VICE News Tonight on HBO, Dozier appeared enthusiastic about the prospect of being executed using fentanyl. "I think it's awesome. I mean, it's killing people all over the place," Dozier told the program. "You guys get pharmaceutical grade fentanyl and just bang me up man." David Juurlink, an expert in toxicology at the University of Toronto, told NPR that the role of fentanyl in this protocol is to sedate a person and stop their breathing. This three-drug cocktail, he said, "sounds like a genuinely lethal regimen that I would imagine would be associated with very little discomfort." "An individual with a decent intravenous line who is given a large amount of fentanyl intravenously would literally, within seconds, become unconscious and their breathing would slow," he said. And though it is part of a three-drug protocol, Juurlink added that fentanyl could be powerful enough to work on its own. He added that the death penalty makes him uneasy. With this execution up in the air, it's not clear what Nevada plans to do now. It's an increasingly common issue around the country. "We've seen them look for different drugs. We've seen them look for different methods. We've seen them consider abolishing the death penalty," said Dunham. "They've gone in all those different directions. And I think that as it becomes clearer and clearer that the use of lethal injection is going to involve breaking the law or breaking contracts and risking torturous executions, states that want to carry out executions are more likely to be looking for other options."